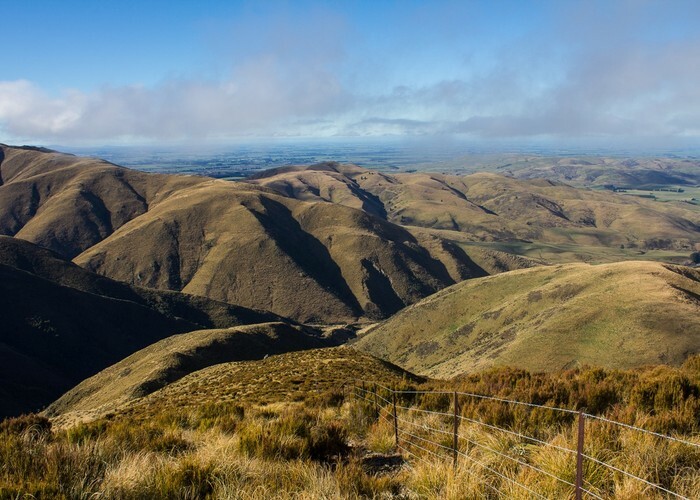 Climb to the low ridge of the Moorhouse Range near the Rangitata River. Coal Hill • By Matthew. 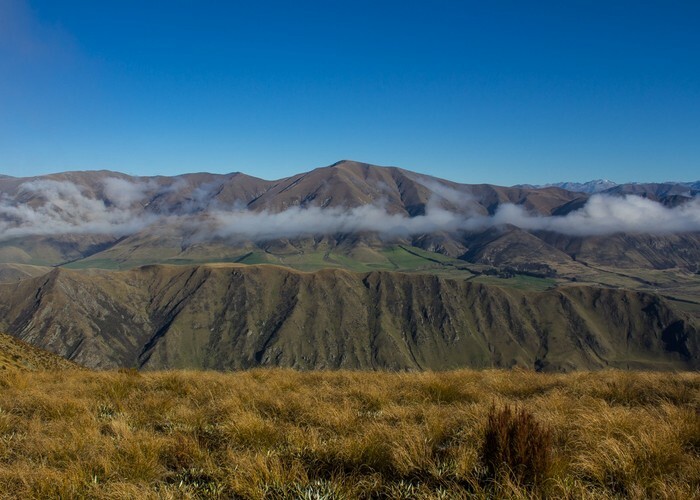 Licence: C.
The Tenehaun Conservation Area occupies parts of the Moorhouse Range above the Rangitata River. The reserve extends from Mount Pukanui in the south to Tripp in the north, but it is hemmed in by high country farmland on all sides. A couple of easements provide access. Rangitata River • By Matthew. Licence: C.
The route described here takes a straightforward but unmarked route up to the ridge line at point 1153. 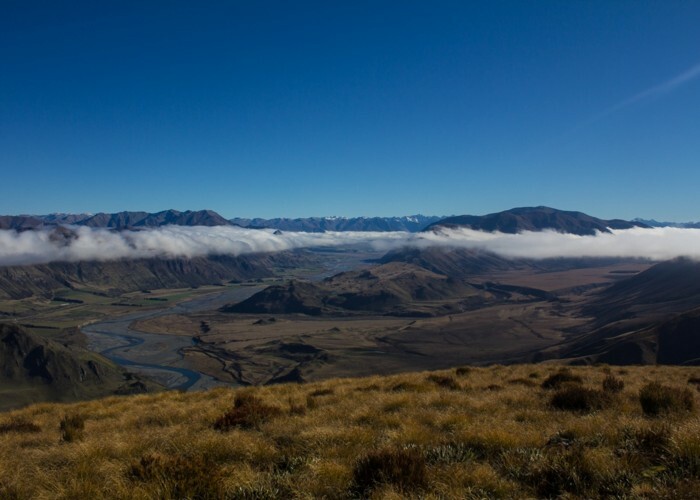 From here, a spectacular view opens out of the Harper and Tara Haoa Ranges, as well as the Rangitata River, looking up toward Mesopotamia. Fenceline, Moorhouse Range • By Matthew. Licence: C.
From Montalto, take Hinds Gorge Road and turn onto Chapmans Road. This ends at a car park. From here, a shingle road leads up to the boundary of the conservation area. The land is private, but an easement allows access along the road. Mountain bikes are also permitted. Follow the shingle road for about 10 minutes, until it splits and bends off to the right. Marker posts lead the way around the hillside to meet the Hinds River South Branch. The hillsides here are covered in snow tussock, matagouri, and a sprinkle of cabbage trees. Shortly, the track meets a gate at the edge of the conservation area. The poles end here. 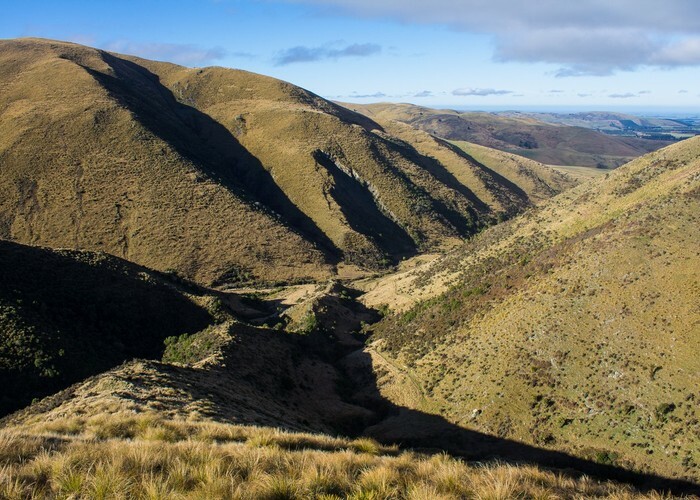 Spur, Moorhouse Range • By Matthew. Licence: C.
Through the gate, follow the stream up past the weir and cross as needed, approaching a hillside with a visible old vehicle track cutting across it. Take this track up to the spur and follow the old fenceline up the spur. The walking is relatively clear and easy close by the fence. The route climbs quickly, passing into turpentine scrub as it gets higher, up over a false summit just before the top, then breaking out onto the ridge. Directly below and out of sight are the rapids of the Rangitata River, with Coal Hill opposite, and Fox Peak visible through a gap. To the right are the Low Hills of the Harper Range, with Mesopotamia in the distance beyond. Further right is the Pudding Valley, once filled by a glacial tongue. Added 29 May 2017 by MatthewMatthew. 4 revisions, most recently 30 May 2017 by MatthewMatthew.